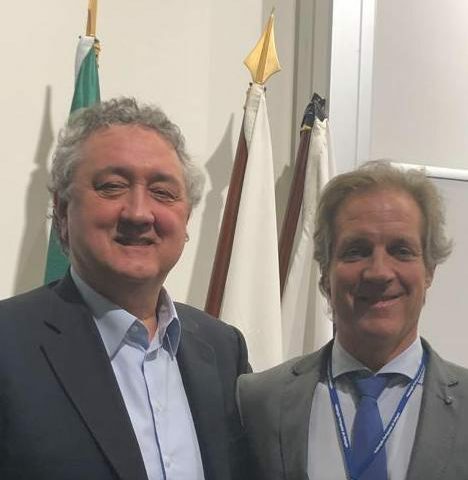 LEN President Paolo Barelli was one of the keynote speakers at an important international seminar in Lisbon, dedicated to ‘Aquatic competence – an added value measure in basic education’. Mr Barelli held a lecture on LEN’s most important social initiative, the “Learn-to-Swim, Prevent Drowning” programme. According to recent statistics by the World Health Organisation (WHO), 27,000 people drown in Europe in every year, three in every hour, mostly children aged 3-12. LEN has launched this initiative targeting to decrease the number of the fatalities by at least 20 per cent in the next five years. The LEN President underlined that more and more national federations had started applying the programme and introducing the LEN Standards in swimming education. “This is to be connected with a campaign on the values of swimming, promotion of the Culture of Water which should lead to have more people in Europe swimming more effectively, more regularly and more safely” he said. On the occasion of the seminar President Barelli had a special meeting with the President of the Portugal Swimming Federation Antonio J. Silva where they overviewed the preparations for the 2021 European Short-Course Swimming Championships to be held in Lisbon.